Available in ebook, audio & paperback!! 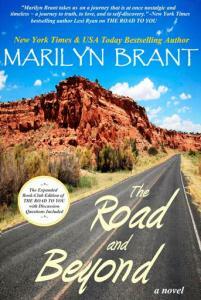 The Road and Beyond is the expanded book-club edition of The Road to You. This novel contains not only the completed original story set in the late 1970s, but it also includes the brand-new present-day tale of Aurora, now a mature and married woman with two adult sons, who must confront her worst parental nightmare. Aurora Gray is no stranger to tragedy. In the summer of 1976, when she was just sixteen, her world turned upside down when her big brother Gideon and his best friend Jeremy disappeared. For two years, there’s no word from either of them. No trace of their whereabouts. But then, shortly after her high-school graduation, she unexpectedly finds her brother’s journal and sees that it’s been written in again. Recently. By him. There are secret messages coded within the journal’s pages and Aurora, who is unusually perceptive and a natural puzzle solver, is determined to follow where they lead, no matter what the cost. She confides in the only person she feels might help her interpret the clues: Donovan McCafferty, Jeremy’s older brother and a guy she’s always been drawn to…even against her better judgment. 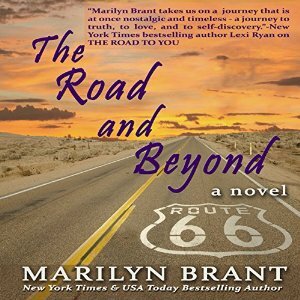 The two of them set out on a road trip of discovery and danger, heading westward along America’s historic Route 66 in search of their siblings and the answers to questions they haven’t dared to ask aloud. The mystery they uncover will forever change the course of their lives. Decades later, in the summer of 2014, fifty-four-year-old Aurora receives a terrifying phone call—her adult son Charlie is missing—and this news inevitably brings the memories of her adolescent years rushing back. Haunting recollections she’d hoped to keep buried. Were the choices she’d made in her youth responsible for her son’s disappearance now? And how on earth can she find him—quickly—so that she might be able to prevent the trauma of the past from repeating itself? Available now in audio from Post Hypnotic Press via Audible!! This is an excerpt from my women’s fiction romantic mystery, THE ROAD AND BEYOND: The Expanded Book-Club Edition of THE ROAD TO YOU. This novel contains not only the completed original story about teenager Aurora Gray’s search for her missing brother in the 1970s, but it also includes the brand-new present-day tale of Aurora, now a mature and married woman with two adult sons, who must confront her worst parental nightmare, copyright 2014 by Marilyn Brant. Happy reading! No one else was home, of course, when I got the call that my twenty-eight-year-old son was missing. “The Benson Plastics people are already here for the eleven o’clock presentation, but Charlie isn’t,” Gloria, the company’s secretary, informed me, her piercing voice tinged with an edge of hysteria. I’d only spoken with the woman on the phone twice before, but I got the distinct impression that her circuits were forever at risk of being overloaded. “He’s not answering his cell?” I asked, surprised more than anything, actually, because both of my boys had their iPhones all but super-glued to their palms. Then the deeper meaning of the secretary’s comments seeped in. No one knows where Charlie is. I tried to be calm, reasonable, rational and not like some TV sitcom mother who’d overreact to everything. But, naturally, given my family’s history, that was impossible. I understood instinctively that Gloria’s first priority and much of her loyalty was to the company—Cornman, Grabher & Pressly—a financial firm my youngest son had worked at for these past three years. But it irked me that her focus remained on not disappointing “the plastics people,” rather than on my son’s safety. “He never said anything to me about being gone from work today,” I admitted, my mind reeling with that ever-present parental worry, which spun a dangerous path from my head to my gut. It settled there and began its slow, painful twisting. Where is he? Is he okay? Why didn’t he tell anyone where he was going? Unless, of course, he wasn’t able to tell because he was hurt or in danger…or worse. The questions started, and it was like 1976 all over again. I hung up. I knew my son. He was a risk taker, an adventurous type, the kind of guy who loved thrill rides and fast cars and extreme sports. Different from his computer-obsessed older brother, who played Xbox when he was in the mood for serious activity and read ebooks when he was tired of programming things on his PC. But Charlie wasn’t irresponsible. If he was going to be gone from work, he would have told somebody. Maybe not me, but someone. I thought back to when I’d spoken with him last—on Wednesday night. I’d asked him about his girlfriend Cassandra. She’s okay, he’d said. And about work. Yeah, it’s fine. And if he had any special plans coming up. Nope. The ticking clock on the wall marked the passing minutes as my worry flooded the rest of my body. Ripples of dread meted out in sixty-second increments. Everything had seemed all right with him just two days ago but, then, kids often lied to their parents or, at the very least, withheld crucial information. ***DON’T MISS the Route 66 Road Trip pictures! Check them out HERE! !